Professor Siri was under treatment for an eye problem. Chemainus is a small city with a current population of 3,900 people located in the east coast of Vancour islands between the mountain range and the ocean. This is identified as the town born with the hands of labourers. The original people of this land were made to work for those who arrived for business. Mining, forestry and fishing were the recourses that attracted the Chinese, Japanese and the Germans to this land. Basically it was land of workers. The main recourse that kept this place going was the timber industry. These recourses came to an end with the rapid felling of the trees and it came to a situation where the people had to look for new avenues to keep the place going. If not it was sure to be an abandoned ghost town. On top of this British Colombia went in to recession in 1981 and faced a tough economic situation. These unfavourable factors made the situation worst. There was the young Mayor of this city named Graham Bruce. He was a hardworking young man trusted by the people as a man with a vision. He was thinking of keeping the city economically live in this bad situation. He was unable to restore the resources like forestry that have already finished. He was thinking and discussing with the community as to what action should be taken as the timber factories had no more trees to work. People were sure to migrate to other places in search of employment. Chemainus would soon become a ghost town. He came with a bright and a challenging idea of making Chemainus a tourist city. Many people laughed when he proposed to make this isolated city a tourist attractions. Added disadvantage to his dream was the location of Chemainus away from the main road. 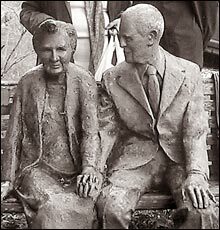 Graham Bruce's idea was to do large murals and sculptures related to the timber industry, fishing and mining in selected position of the city. He believed that visitors will begin to come to see this unusual mural city in the world. He convinced the people that when tourists come there will be a new hotel industry and many eating places would grow with it. Then the visitors will want to buy souvenirs. They could be sold handicraft and that the sea and the Chemainus river could be directed for entertainment. Then this great ambitious plan was launched with a bang. Reputed painters arrived and the murals began to appear in the town.. The young Mayors plan worked as he expected and Chemainus which was to be a Ghost town won the international award for the most creative city within a few years. The plan worked as desired and the tourists began to pour into the city. It is today an icon in the tourism map of the world. As per the Mayors dream it is today city visited by thousand of tourists. It is a city full of hotels, eating places, handicraft shops and other tourist attractions. We drove there amidst rain and when we arrived in the city it was drizzling. 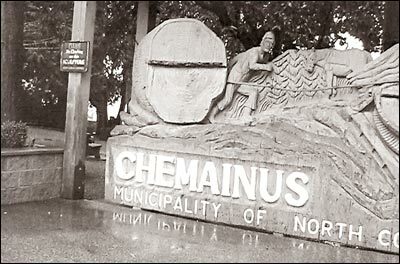 We first arrived at the sculpture where the name of the city "Chemainus" is written. That single colour work is a master piece of art. I forgot of the drizzle. Every one including professor Siri Gunasinghe and Hemamali were soon out in the rain. Soon we began making photographs. There are more than forty large murals in the city and the first one we stopped is supposed to be a master piece. The title of it was "NATURE HERITAGE" a painting done in 1983 by an artist by the name of Paul Ygartua of Vancoure. It is a mural of fifty feet by twenty. 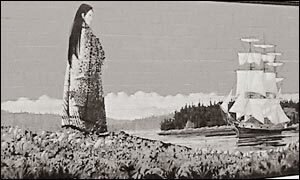 It is of the original people that lived in Chemainus. Luck was on our side and the rain gradually diminished. We were then able to move around the city for hours admiring the murals and the various sculptures made in the city. There were photo points for the visitors to make picture. I think it would be of use to the readers if I name a few of the key murals and the artists and the sizes of those creations. Artist Frank Lewis's painting at the Willow street painting is 108 feet by 14 feet and is titled "Hauling a lo from the forest". This is one of the long murals in the city and it is so well painted the character look live. His painting on the Legion street is "Harbor in Action" depicts the logs being loaded to the train, transported the harbor and how they are loaded to the ships. "Steam Train n the bridge" by Pau IMarcano of Victoria, 26 feet by 15, "Fallers undercutting a fur" a mural of tree cutters chopping a tree is one which won my heart. It depicts the hugeness of the tree. "Arrival of reindeer" is a popular mural of the city done by artists Sandy Clark and Lea Goward. 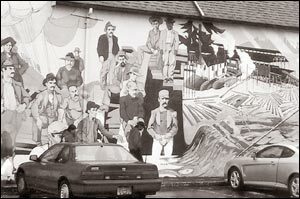 Thmainu Che mural at the Water wheel parking lot titled "logging with oxen by Harold lyon is one mural that non would miss because of its prime location "The Parking lot". There is a painting depicting the 1891 era of Chemainus which is of value and it is done by an artist name Davis and it is 54 feet by 12 feet. "Camp on a Sunday" is yet another great mural by an artist called David J more. We were offered a grand lunch by the Gunasinghe family at the city of Murals and professor and the wife were kind enough to gift a book to my wife Swarna and myself that contains the photographs of all the murals in the city. We were so glad that we visited the world's number one mural city. It is an experience to be remembered life long. The example of Chemainus can be used effectively in suitable ways for the development of the tourists industry in Sri Lanka. Paintings and murals are powerful instruments that could be used in the task of the nation building.